Everyone looks forward to a Walt Disney World vacation. Guests spend months counting down the days to the precious time spent there and spend months sometimes saving up the money they know they will spend there. Since a Walt Disney World vacation can be costly, guests want to be able to spend their time and money wisely once in the parks while still enjoying themselves. These are some easy ways to save both time and money at Walt Disney World to ensure a magical vacation for everyone! FastPass+ is a system designed so that guests can reserve their spot on an attraction’s line before even leaving home. Guests staying at a Disney Resort are able to book their reservations up to sixty days before arrival and guests staying off property can book their reservations up to thirty days in advance. Guests can book up to three FastPasses in advance for one park and if they use all three throughout their day are able to book a fourth, then a fifth, and so on until the park closes. FastPass+ can save lots of time that would otherwise be spent waiting in line, so the smartest way to use this tool is to book FastPass+ selections for the most popular attractions which in turn have the highest wait times. Just be sure to have a grasp on the Tier System at all park except Magic Kingdom. Some of the best attraction options to pick from are Slinky Dog Dash, Alien Swirling Saucers, Avatar Flight of Passage, Na’vi River Journey, Space Mountain, The Seven Dwarfs Mine Train, Test Track, Soarin’, Toy Story Mania, The Twilight Zone Tower of Terror, Expedition Everest, and Dinosaur. Extra Magic Hours are special times in the mornings and evenings where certain parks are open exclusively for resort guests and are generally less crowded and have lower wait times for attractions. Usually one park will open an hour early for resort guests and a different park will remain open up to three hours later for resort guests. By visiting parks during Extra Magic Hours, guests are able to experience lower crowd volume and spend lots of time saved waiting on line since the wait times will be lower than when the park is open to the general public. This simple tip can save a few minutes at a time while waiting on line for an attraction. Some attractions, like Big Thunder Mountain Railroad, have queues that split midway through the wait. Many guests tend to automatically go right, making that side of the line slightly longer than the left. So whenever there is a split, try going left to save a few minutes time on line. It’s super simple to use Mobile Ordering at numerous Quick Service Restaurants throughout Disney World Property. Order and pay for your food from the My Disney Experience app and pick up your food from a separate Mobile Order window when you arrive. It’s awesome! 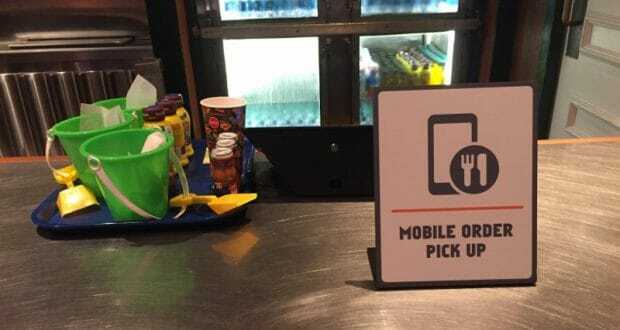 Quick Service locations accepting Mobile Ordering are growing quickly and include multiple restaurants in each park as well as some at Disney Springs. If guests partake in the Disney Dining Plan they are allotted two snack credits per day. These credits can be used on everything from a bottle of water to a Mickey Premium Ice Cream Bar. To save some money, guests should do a little research into which snacks they would like to use their snack credits on and choose the most expensive items on the list. By using snack credits on the more expensive things, guests will have to pay less for the other items that are paid for out of pocket saving a few dollars in the long run. A great time to use this strategy is during the Epcot International Food and Wine Festival where certain snack credit eligible food options can run close to seven dollars making it a much more reasonable choice than a three dollar water or snack. For guests with Disney Visa credit cards, there are certain discounts offered throughout the parks to save a little money during a vacation. Certain stores including the World of Disney in Disney Springs offer ten percent off an entire purchase if it is paid for using the credit card. In addition, certain behind the scenes tours also offer discounts for card members. Guests can also earn points by spending with the card while at home that can be redeemed as reward money to be spent in the parks! Booking dining reservations ahead of time can save both time and money on a Disney World vacation. By booking ahead of time, guests save time that would otherwise be spent either waiting to be seated at a busy restaurant or trying to figure out other dining options if that restaurant is fully booked. Guests can also save money by making advanced dining reservations if they are using the Disney Dining Plan. This especially applies to guests who are eligible for a free Disney Dining Plan as part of their package when booking their vacation. By doing a little research and figuring out which restaurants would end up costing more to dine at, guests can opt to use dining credits at these locations and pay out of pocket for meals that would cost less overall. There is no greater way to save time while in Walt Disney World than to have a rough plan for the day ahead of time. By simply knowing which park to head to, what attractions are the must dos, and what dining locations they want to try, guests can save time wandering through the park or consulting maps trying to figure out where to head next and what to see. Don’t go too crazy planning, a little spontaneity is great on vacation, but do try to have a rough idea of a day’s plan to save time.